Not long ago I had mention that I wanted to add something new to my blog, I been planning it out how will I do it for a while and I think I finally found a way. I still have few more things plan out, which soon will be produced. I decided to share some of my favourites blog with you, I'm just not sure if I will do it weekly or every fortnight. I love reading post like this, as I normally always find new blogs to read and believe me I read many blogs, although I don't comment all. I love looking at different design, content and the different personality. Blogs to me are like online scrapbook, which you build over years. Here are one of my favourites. Just to let you know before hand I'm the one who pick the blog, and I will pick different ones each time. So watch this spot you may be next. I had been following Alice blog for a while now, I love Alice's blog posts. 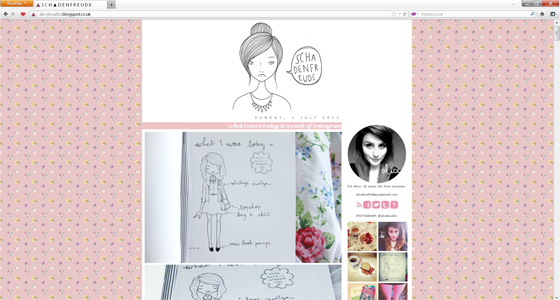 Her blog design is so pretty and girly. She has great talent for sketching/drawing. I'm also really liking her style, she always look so pretty in her OOTD photos. You can also find some beauty reviews. The photos are also very pretty and amazing quality. 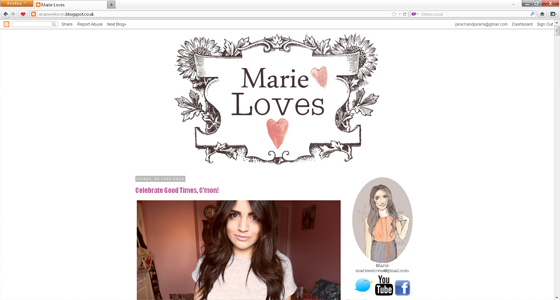 Marie is another amazing blogger, I love her style and make-up. The blog contains a bit of beauty and fashion. Wish I could pull maxi skirts as well as Marie can. I could go on forever what I love about Marie blog. Her blog heather is so pretty and memorable. Marie also does Youtube videos. 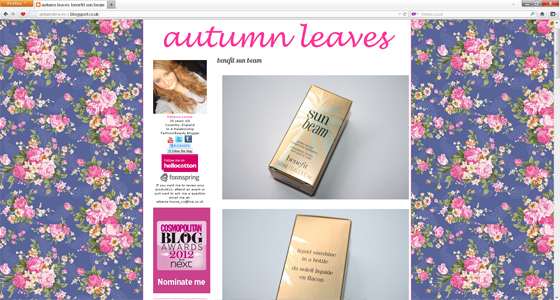 Rebecca-Louise is another amazing blogger! Her blog is amazing! I love the simple reviews, they are so easy to read. Her photos are really nice too. Rebecca has amazing personality. Her blog has lovely floral background which is very memorable, easy to remember the blog, if that makes any sense. And Rebecca is as pale as me, which is a good thing as this makes my life easier when someone does beauty reviews and have almost the same complexions as yourself. Molly is the youngest blogger who I really like. Her post are full of everything. Her personality is so lovely. BTW I love her handwriting, which you may spot in her newest post, so neat. In my opinion she deserves much more readers than she has right now. The first thing that caught my eye in Sopiha's blog is the design, it's so pretty! 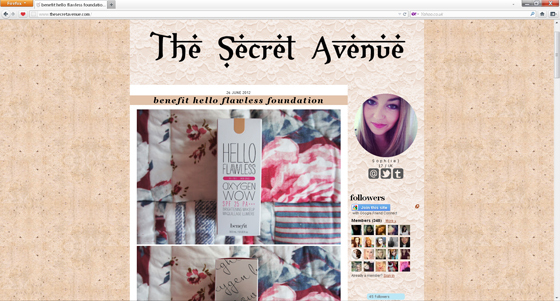 I'm in love with the whole blog layout. Her photos have such a great quality. Her reviews make me want to try out most of the stuff, Yes I do need RT Core set and Eye set. I would also like to find out how do you make your photos so good, I love the background in them. Hope that some you found some new lovely blogs to read and hopefully you would like to see more post like this, please let me know. This is such a lovely idea!! I love being introduced to new blogs because I haven't been on here for long so feel there's plenty i'm missing out on! This is such a great idea, showcasing blogs you like for others to admire. Really helps share the love! I think everyone needs a little of this on their blog, grow the community a little. I'm checking out the blogs above and I'm loving them. Thanks for showing me your favorites! Love discovering new blogs! :) They're all so pretty!! Thank you! Love checking out new blogs! These are great! this is fantastic. I will definitely check them out. thanks for sharing! AWWWH THANK YOU!! You're so cute, I really appreciate this!